If you have a chain-link fence but would prefer something wooden, it's possible to reuse the structure of your metal fence. Converting chain-link fences into wood fences is an accessible project as long as your metal posts are firmly planted in the ground. Before you begin, you'll need to determine how much lumber you need. Measure the distance from one end of your current fence to the other. Then, determine how high you'd like the fence to be. It shouldn't extend much beyond the chain-link fence as it may not be properly supported. Multiply the length of the fence by the height to determine the square footage of lumber of prefabricated fence you'll need. 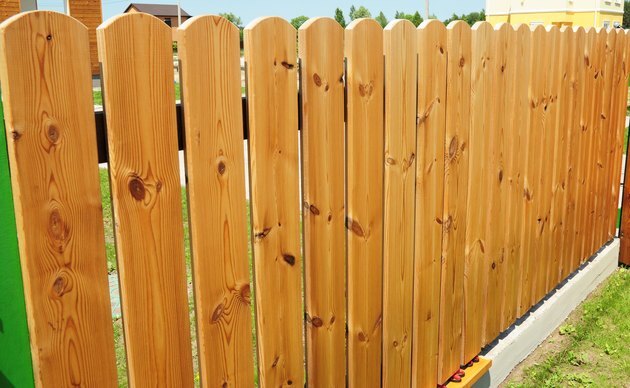 Remember, if you're using loose lumber you need to deduct square footage for the gaps between your fence's vertical slats. In addition, you'll need to use horizontal support beams behind the fence's vertical pieces. Aim for at least two or three rows of these stringers, and therefore add two to three fence lengths of lumber to your shopping list. Use a socket wrench or screwdriver to remove the bolts or screws connecting your fence's top rail to the metal posts. With the assistance of another adult, remove the top rail from the fence. You can purchase lumber or use a prefabricated fence like those sold at home improvement stores. In either case, you will need tension bands, bolts, washers and nuts. If you are using lumber on its own, you'll need some to function as horizontal support pieces, also called stringers. Wrap a tension band around two metal fence supports. Measure the distance between your metal support posts from the edge of each tension band. Next, mark that distance on your horizontal support beams or prefabricated fence. This is where you will need to drill holes for the bolts. If you're using prefabricated fence sections, they will need to be this size to be properly supported. You can cut them using a standard saw. Attach tension bands to either your prefabricated fence or to horizontal support beams via a bolt. Secure the bolt with a washer and nut. Continue in this pattern until each set of metal support posts has wood between it. You should use horizontal beams at more than one height to best support the vertical pieces. If you have used horizontal support beams only, use your other lumber to create vertical slats for your fence. Attach these at the horizontal beam with a screw.